What a beautiful lily, Orin! I like lilies a lot, but have only common day lilies in my yard. Hmmm... I should do something to change that, shouldn't I? owlice wrote: What a beautiful lily, Orin! I like lilies a lot, but have only common day lilies in my yard. I use day lilies as a water shed along the west end of the basement. They really grow thick and their roots keep the basement nice and dry; A bonus is that they are really pretty! I do have to watch them as they try to grow into my regular flower bed. Your lily isn't blue, Orin, but it's really very lovely! Ann, i don't have any pictures of blue flowers, but how about some blue sky? It goes with everything. That's the best color of the sky, isn't it? Except when you want to observe some stars! I didn't think I was starting a blue thread! Ann: it ain't blue; but most lilies aren't! I don't think I ever seen a blue lily. Will a yellow one do? from wiki! Especially for Ann! Ej öron, ej öron, ej svansar have de. -------------------No ears, no ears, no tails have they. I actually didn't dance yesterday, and I didn't sing "Små grodorna", and I drank very little, but I ate a lot. Strawberries, strawberries and more strawberries, and a lot of "sill" - Swedish pickled herring - and a lot of tender new potatoes. And I got to bed very late. So earlier today I got very tired and lay down on the couch, where I fell asleep, without getting off line from Starship Asterisk. So that's why I haven't replied before! Again, thank you very much for your lovely lilies, Orin! Last edited by Ann on Sat Jun 25, 2011 5:40 pm, edited 2 times in total. And to think that most of the world thinks americans are strange. I currently have black-eyed susans blooming in the backyard. These are volunteers; no need to plant them, as they pop up in various places. They are the state flower of Maryland, the colors (black and gold) the same as that of the Calvert family coat of arms, which is represented (along with the Crossland coat of arms) on the state flag. owlice wrote: I currently have black-eyed susans blooming in the backyard. Owlice; I'll gladly trade you my wild violets for you Black-eyed Susans! The darn things are taking over my lawn and Weed-be-gone don't seem to affect them. Any way here is my Hollyhock. Orin, I'd be happy to send the heads of these to you after they've gone to seed. They pop up everywhere and are very hardy. Are they as hard to control as dandelions? No; if they grow in the yard, mowing keeping them from flowering. I don't treat my lawn with anything (hence the reason these things pop up everywhere), but any systemic broadleaf control chemical would likely keep them from growing in the lawn entirely. Also, they are much easier to uproot than dandelions, should you feel the need to do so; they don't have a deep taproot. They are polite enough to be invited into gardens. orin stepanek wrote: Are they as hard to control as dandelions? Personally I like dandelions; but none of the neighbors do; so I spray them once a year! Out here they are considered a weed. I still get my share of them as they are very hardy. I don't know why they are so disliked. Besides they only bloom in the early spring and fall! 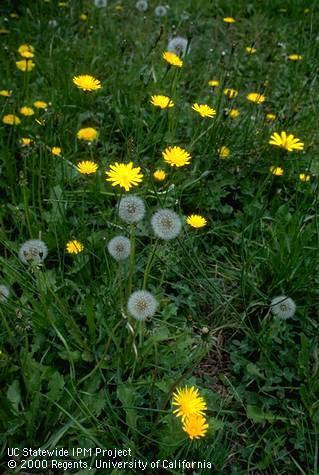 orin stepanek wrote: Personally I like dandelions; but none of the neighbors do; so I spray them once a year! Out here they are considered a weed. I still get my share of them as they are very hardy. I don't know why they are so disliked. Besides they only bloom in the early spring and fall! Up here they bloom continuously from May through October (pretty much nothing blooms outside that range). I think my neighbors are okay with dandelions, but since the nearest neighbors are 1/4 mile away, what grows around my house doesn't much affect them. This is one of summer’s prettiest sights. And yet it’s just a boring old leek. Quite a lot of vegetables have lovely flowers. Potatoes, for example, can be gorgeous on a bright summer day. Art; thanks, I never seen a leek bloom before. I had some wild onions in my flower bed last year. I didn't know what they were until I pulled then out and saw the small onions. They smelled like onions anyway. As for lillies, the only ones i have are orange Day lillies. I do have different Iris' though. Here's one that seems to me to be really photogenic. It's just so nice to look at on my 24" monitor. Beyond wrote: I do have different Iris' though. Here's one that seems to me to be really photogenic. It's just so nice to look at on my 24" monitor. Hey Beyond! My daylilies aren't blooming yet and my Irises are done blooming. the Iris is a most beautiful flower. I do have a tiger lily in bloom though. My mom just loved tiger Lillie's.